The first room contains work from Freud’s art school days, through to the early 1950s. The earliest work in the exhibition, Box of Apples in Wales 1939, was painted in the year Freud started at the Central School of Art, London. He spent only a few months there before going on to the more informal East Anglian School of Painting and Drawing in Essex, run by Cedric Morris. In 1948 Freud married Kitty Garman, daughter of the sculptor Jacob Epstein and the collector Kathleen Garman. Kitty appears in a number of portraits, including Girl with Roses 1947-8 and Girl with a White Dog 1950-1. In 1951 Freud was one of sixty artists invited to submit a painting for the Arts Council’s Sixty Paintings for 51 exhibition during the Festival of Britain. Interior in Paddington 1951 was one of five awarded a £500 purchase prize. Also in the early 1950s Freud painted portraits of two contemporary artists: Francis Bacon and John Minton. The portrait of Bacon could not be included in this exhibition, as it was stolen in 1988, when it was on loan from the Tate Gallery to a gallery in Berlin. 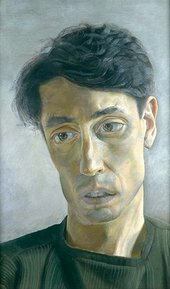 The portrait of John Minton 1952, which he commissioned after seeing the one of Bacon, was bequeathed at Minton’s death in 1957 to the Royal College of Art, where he had been a teacher. This is the last of the series of portraits of his first wife, Kitty, which Freud had begun at the end of the 1940s. It shows Kitty, her wedding ring displayed on her left hand, curled up on a striped mattress on the floor, with a white bull terrier, one of a pair they were given as a wedding present. It is painted in an extraordinarily detailed style which, combined with the emphasis on Kitty’s features, heightens the look of painful loneliness in her face. Freud won a prize for this painting, commissioned for the Arts Council’s exhibition Sixty Paintings for 51, as part of the Festival of Britain. The canvas, unusually large for the post war period when canvas was still in short supply, was provided by the Arts Council. The painting itself conveys a sense of the anxiety and want associated with the last years of rationing. 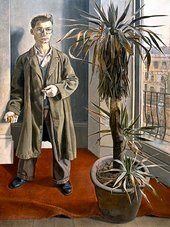 A sort of double portrait, it shows Harry Diamond, an East-Ender who at the time was working as a stage-hand, standing by a potted plant. Diamond complained bitterly while posing, but Freud was stimulated by his resentful aggressiveness: ‘He said I made his legs too short: the whole thing was that his legs were too short. He was aggressive as he had a bad time being brought up in the East End and being persecuted.’ The red carpet was bought especially for the painting, from a junk shop, and Freud was particularly proud of the way he painted it. Through the window is the Grand Union Canal and the area of London known at Little Venice. Despite its clear avoidance of the celebratory tones of the Festival of Britain, the painting was one of five awarded a £500 purchase prize. John Minton was a painter and illustrator who taught at the Royal College of Art, where he advocated the tradition of figure painting, although by the early 1950s, when this portrait was painted, his work had become unfashionable. He is probably now best remembered for his illustrations to Elizabeth David’s Mediterranean Food. Minton commissioned this portrait from Freud in 1952, after he had seen Freud’s portrait of Francis Bacon. His face seems full of regret, and the painting of his eyes suggests deep unhappiness. Minton committed suicide in 1957; he bequeathed this portrait to the Royal College of Art.